First finding candidate articles through a literature review and expert opinion survey of geriatric medicine faculty. Winnowing this list down to 30 and then performing a bibliometric analysis that combined journal impact factor and average monthly citation index. Lastly, bring a panel together to review articles to assess each manuscript’s clinical relevance. For each of the final 27 articles, a score was determined by averaging, with equal weight, the opinion survey, bibliometric analysis, and consensus panel review. We’ve included in the note section below a list and ranking of the Geriatrics Landmark articles, and have included links to their PubMed pages. While we can probably think of other articles not on this list, the published list does serve as a wonderful resource for anyone in the field of geriatrics. 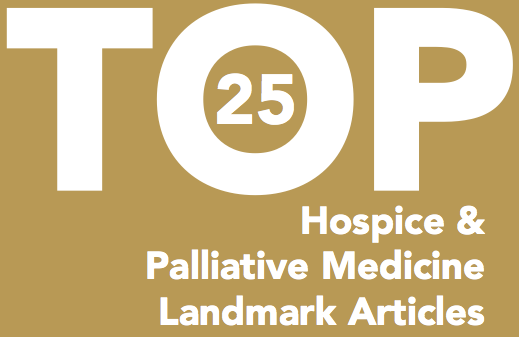 Thinking about these top 27 articles in geriatrics got us interested in putting together a list of the top 25 articles in palliative care. The timing is good as on February 19th we will be giving a talk to our palliative care fellows on this very subject. We have decided to focus on palliative care studies and trials - as opposed to review articles, consensus statements and opinion pieces - in order to narrow our focus and cater to our academically-oriented fellows. We're guessing there may be some overlap with the published geriatrics list. We are also guessing it may include many of the articles that Diane Meier wrote about in her book Palliative Care: Transforming the Care of Serious Illness. However, we are interested to see what articles you all think have shaped the contemporary practice of the hospice and palliative care field. So here is a plea for your help: What articles have you found most impactful in the fields of hospice and palliative care? What studies do you most commonly think about, mention, and cite during your clinical work? Effectiveness of atypical antipsychotic drugs in patients with Alzheimer’s disease Schneider LS et al. NEJM, Oct 2006. Thank you for this list. I wish more specialties did this Great source to refer to periodically. WOW! Just came to this looking for a list of articles. This post most seriously needs a follow-up post!